Careers in college athletics, turf management and construction are not typically sought after by many women. However, it’s in these fields that several local women have found their professional homes. Heather Lyke, the new athletic director (AD) for the University of Pittsburgh, is one of the most notable women in what is typically considered a male-dominated field. Hired in March 2017, she is the first female athletic director since the school created the position in 1911. Lyke said she initially eyed a career as an elementary education teacher. She earned a bachelor’s degree in education from the University of Michigan in 1992 and, in 1995, a juris doctorate from the University of Akron’s School of Law. While at Michigan, she captained the school’s Big Ten champion softball team. Lyke has spent 22 years in college athletics in positions of increasing authority, beginning as an intern with the NCAA, followed by full-time posts with the University of Cincinnati and Ohio State University. She comes to Pitt from Eastern Michigan University, where she served as its vice president and director of athletics since 2013. Turf management is another field with few women professionals. That’s not a problem for Rebecca Auchter, grounds maintenance manager at Cranberry Township. Auchter recently received the highest certification of the national Sports Turf Managers Association. She’s one of 10 women in the country to earn the distinction of Certified Sports Field Manager, according to the association. As grounds maintenance manager, Auchter is responsible for maintaining more than 330 acres for Cranberry Township. This includes 40 acres of athletic field turf in three community parks and 18 or 19 satellite properties. She manages a staff of five full-time employees and an additional 15 seasonal employees from March through November. Her job entails hiring and training staff, and managing the grounds budget and capital program. Auchter wasn’t always interested in turf management. A college athlete, she was a political science/prelaw major at Pennsylvania State University. But, after working several summers in grounds maintenance at a golf course, she changed direction. She enrolled at Ohio State University, where she received an associate degree in agriculture with a concentration in turf management. After completing school, Auchter worked for 15 years in turf management at several golf courses, including the former Highland Golf Club in Ross Township as an assistant superintendent. In 2005, she left golf courses to work at two colleges before coming to Cranberry Township in 2010. During her career, Auchter did face one challenge in the golf club environment. As a woman, it was difficult to advance to the top position of superintendent in clubs that were private, because many have gender-specific rules for golfing as well as dining. “The men’s grille room was where most of the wheeling and dealing happens and I couldn’t even go in there,” Auchter said. In construction-related professions, few women hold leadership roles, so mentors can be scarce, said Carmin Sbarro, a geotechnical designer and president of the Pittsburgh Chapter of the National Association of Women in Construction (NAWIC). With 10 years of experience in the engineering field, Sbarro has spent the last 7-1/2 years as a project designer for the Pittsburgh office of Raudenbush Engineering, Inc. She works in the Geotechnical Department designing foundations. Sbarro has always been drawn to dirt. When she was younger, she wanted to be an archeologist. She chose engineering because it was more practical. She earned her bachelor’s degree in civil engineering in 2005 and her master’s in geotechnical engineering in 2007. She especially likes the geotechnical field because of its unpredictability. “A lot of times, you have to figure out how to solve problems. You can’t really control the quality of the soil and bedrock, and I like that. It keeps me on my toes,” she said. The professional group that Sbarro leads provides a platform for women to connect. The Pittsburgh NAWIC meets once a month to network, listen to speakers or to go on site tours. The local organization also annually sponsors a LEGO® building competition for elementary students, a computer-aided design and drafting competition for high schoolers and scholarships for apprentices in the building trades—all open to both genders. Women can and do flourish in fields that have been traditionally male-dominated. The right attitude, mentors and the support of professional organizations can help make the journey a little smoother. Jane Dillner of Dillner Family Farm in Gibsonia has the advantage of being an expert in two fields. Born into a farming family, she learned how to work the soil from birth. She also spent 22 years as a nurse, a career she was able to pursue while continuing to work on the farm. About 10 years ago, Dillner decided to leave nursing to focus her efforts on the farm that she runs with her husband, Don. Still, her nursing education continues to serve her well. “I have an advantage because as a nurse I specialized in health and nutrition,” Dillner said. She now also has a role in education, representing the farm as a speaker at health and wellness fairs. The Dillners promote the education of future farmers by hiring several college interns each growing season. Most of them, Dillner noted, are female, although they do currently employ one male military veteran. Their interns primarily come from local colleges such as Slippery Rock University and Chatham University. In fact, the Eden Hall Campus of Chatham’s Falk School of Sustainability & Environment in Gibsonia sits on land that was formerly farmed by the Dillner family. Dillner’s advice to women—and men—interested in a career in agriculture is to get an education since it enables farmers to keep current with technology that improves crop yield and quality. The Dillners practice sustainable agriculture, meaning they use environmentally friendly techniques for crop production. They sell their fruits and vegetables at their own farm stand and at 10 Pittsburgh area farm markets. Additionally, they run a Community Supported Agriculture (CSA) program under which customers buy into the farm and receive shares of its produce during the growing season. 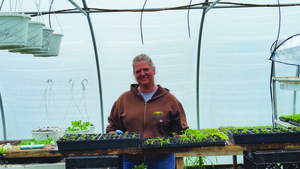 For her part, Dillner manages the farm’s greenhouse, scheduling seeding and taking care of orders. Sometime in mid-May, her work shifts to being a full-time transplanter, operating a machine to transfer plants from the greenhouse into the ground. A bonus for women in farming is that the work is often a family-oriented endeavor. All the kids help; nieces and nephews, too. “I would recommend it to any woman who enjoys the great outdoors. It beats spending eight hours inside. And there’s the benefit of being your own boss,” Dillner said.